It's just one thing after another this spring. First, I get depressed, then I get slammed with work, and now the dang flu! I've been in bed for about a week being awfully sick. Some days I would watch TV, which wasn't much better than the normal headaches I was having. Curse you oh brain wrenching TV! 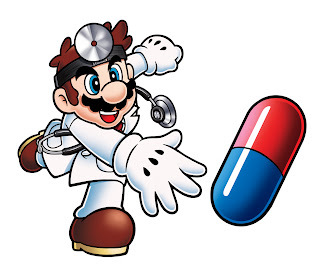 Thankfully I had Dr. Mario to help me through this. He's always there when you need him. Oh wait, that wasn't Dr. Mario, that was my sweet wifey wife. Thanks honey. You've been the best. I'll have to buy you that nurse's outfit for next time. I'm back on me feet now, though still unsteady, but I'm just about out of the woods I think. Hopefully that'll do it for a good long while.